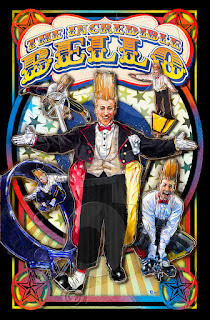 You may have seen him recently on America's Got Talent, but we first learned about Bello several years ago when we first brought my son to the Circus. We were all impressed and enjoyed ourselves but I was especially taken by Bello Nock. Wasn't hard to do a little research to find out more about him and I became even more impressed with him. Over the holidays I usually like to wind down and take a break from "work" so I only dabbled a little here and there on a picture that I had long planned on doing. As usual, with no deadline, I was free to work when I wanted to and at a much slower pace. I was pretty pleased with the result. With the added time I did a few things that I would normally not do in a digital painting like added some depth by dropping shadows behind the figures and shapes giving a slight impression of a cut-out. I also sent him a small copy of the picture via instant message and he responded with great affection. He may even share it on his social media one day.